In celebration of the third annual New York Textile Month, members of the Textile Society of America will author Object of the Day for the month of September. A non-profit professional organization of scholars, educators, and artists in the field of textiles, TSA provides an international forum for the exchange and dissemination of information about textiles worldwide. For some time, I’ve been interested in Japanese textiles and the messages they can convey. In a culture where everyone wore essentially the same T-shaped garment, the difference was in the details: color, materials, motifs, as well as their combinations. Each have specific meaning. 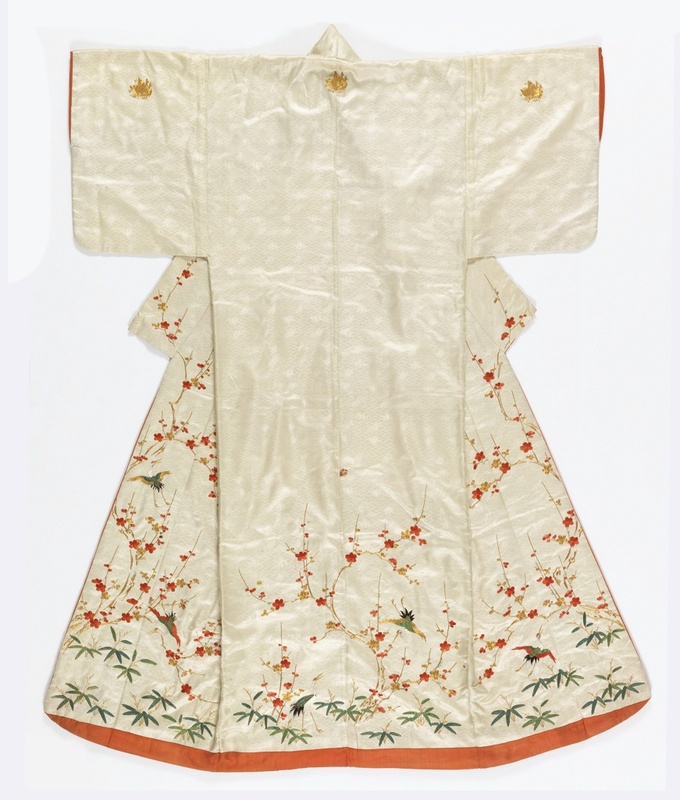 This late Edo era (circa 1800) garment is a kosode or small sleeve-opening kimono. It’s meant to be worn as an outer robe over a formal kimono without the use of an obi or sash. Its red lining is rolled outward over a padded hem, which adds weight and allows the kosode to drape onto the floor like a train. The arrangement of motifs follows the open edges of the kosode, placed along the hem and center front, with a symmetry that is associated with late Edo kimono. The base fabric is a satin damask weave called rinzu. The basket-woven motif is interrupted by a repeat pattern of cranes and turtles, the geometry contrasting with the organic shapes. The crane and the turtle are both considered symbols of longevity. This kosode is embroidered with silk floss in a satin stitch and couch-stitched with gold-wrapped thread. The imagery is a combination of plum blossoms, willow and pine motifs called “the three friends of winter.” Plum blossoms bloom in early spring, even in the snow. Willows bend in the wind. The pine tree is always green and will grow on difficult terrain. Together they represent steadfastness, flexibility and tenacity. The kosode is also embroidered with red-crowned cranes, which mate for life and are considered an auspicious motif for marriage. This kosode also has five kamon, or crests, in a traditional arrangement at chest, center back and center of sleeves; kimonos with five crests are considered the most formal. Kamon were originally created as a way to distinguish Samurai warriors on the battlefield and have become a way of identifying family. The circular crest is also embroidered with gold-wrapped thread. It depicts the swallowtail butterfly used by the Taira family. This kosode with its red padded hem and auspicious motifs of the crane and three friends of winter can be viewed as a precursor to the contemporary wedding uchikake. All of these elements are still used on formal wedding kimono today, more than 200 years later. Janine LeBlanc works as a Collections Assistant at the Gregg Museum of Art and Design, North Carolina State University, Raleigh, NC. Gorgeous item. Thanks for your discussion.